For the 2019 Southern League season, the Biloxi Shuckers are excited to roll out their new 'Shuck Nation' memberships, created to revamp the traditional season ticket into a variety of exclusive experiences and provide better access to the team. The Shuckers will offer a pair of options to join Shuck Nation, including a full-season or weekender membership that start as low as $36/month. 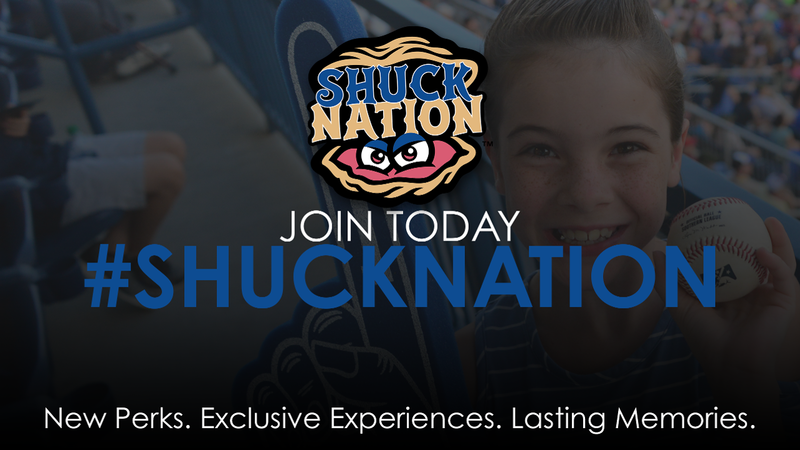 "This program we've created is designed to give members more benefits, events and discounts than they've ever experienced and provide more value to being a member of Shuck Nation," said Biloxi Shuckers General Manager Hunter Reed. "The most important thing to know is it's more than having season tickets and we're not just changing the name to call it a membership. It's like a country club or gym membership; you're going to get invited to quality events and be part of the team throughout the year." New for 2019, Shuck Nation members will have access to monthly VIP social events with featured guests, which will provide great networking opportunities for businesses. Additional perks include chances for members to be on the field for batting practice throughout the season, a Shuck Nation membership card for discounts within MGM Park and around the Mississippi Gulf Coast, and the option to choose a pair of ballpark experiences, which vary from a professional photo on the field, throwing out the first pitch, sitting in the dugout pregame or going up to the Shuckers' broadcast booth. All Shuck Nation memberships will include fully-exchangeable tickets good to use in any quantity for any number of home games when exchanged in advance.Full Shuck Nationmemberships will include the same seat to all 70 home games, while weekender Shuck Nation memberships will feature the same seat for 35 home games for every Friday, Saturday and Sunday, plus Opening Day, July 3 and Fan Appreciation Day. Even if a game day has passed, unused tickets are subject to the unused Shuck Nation ticket policy, and can be redeemed for a Reserved Level ticket for any Sunday through Thursday home game. Shuck Nation memberships also carry over some of the same great advantages of season-ticket holders in the past, including exclusive presale of individual tickets, guaranteed discounted seats for postseason games, first right to purchase tickets to events at MGM Park, and a convenient way to manage memberships online. Full Shuck Nation members yet again will receive a Southern League pass, good for tickets to Shuckers' road games, and a Shuck Nation bus trip to New Orleans to see former Shuckers at the Triple-A level take on the Baby Cakes. Shuck Nation memberships start as low as $36/month for six months and are on sale now. To secure a spot in Shuck Nation, contact a Shuck Nation representative at (228) 233-3465, visit https://www.milb.com/biloxi/tickets/shuck-nation or contact Shuck Nation liaison Allan Lusk at alusk@biloxishuckers.com.